Nike Air Zoom Total 90 III cleats are one of the Nike's signature models. Although the top spots are held by Total 90 Supremacy and Mercurial Vapor III, AZT 90 III are still great soccer cleats and...less expensive. External Heel Counter - all shoes have a heel counter or counter reinforcement. The good, hard ones use a plastic, TR (thermoplastic resin), TPU or nylon material remolded to fit the heel of last. The purpose of the heel counter is to provide support and ensure a good fit. An external heel counter does the same thing, but it is on the outside of the heel. Heel Air Zoom Unit - lightweight, incredibly thin cushioning brings the foot closer to the ground for optimum feel and aggressive maneuverability without sacrificing comfort. Structural Bars  unique and innovative spinal bars; thin and hard but flexible long plates on both sides of the bottom of the shoe. They provide support, stability and motion control at all points along the foot. Although HG cleats are hard (coincidence?) to find. Some people can still argue about which material is better: leather or synthetic, but definitely KNG-100 synthetics softness and lightweight give you extremely good ball feel and great comfort. I am not sure how much better heated and compressed EVA foam is than regular EVA foam but it sounds very encouraging. So does Air Zoom Unit; special material that is placed under the heel to increase cushioning and comfort. I am sure however that the circular studs reduce the stud pressure on your feet and provide you with supreme grip. Also the structural bars are excellent addition to already great soccer cleats. 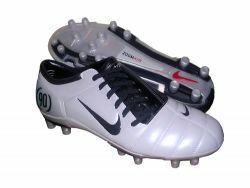 Nike Air Zoom Total 90 III are one of the best of Nike soccer cleats. Perhaps one of the best of all soccer cleats on the market. At least for some people. Wayne Rooney, Roberto Carlos, Freddy Adu and many other professional soccer players use these soccer cleats. Update ! Now they all switched to the new Nike soccer cleats Zoom Total 90 Supremacy but it doesnt mean that AZT 90 III are not good soccer cleats any more. They still are. Of course their cleats are little bit different then those available for the public. Nike soccer cleats for players like Rooney or Carlos are custom made to their feet characteristics and their own preferences. However, Nike Air Zoom Total 90 III from mass line production still have the same features that make these cleats one of the best. you can afford buying these Nike soccer cleats every 6-8 months. Remember, synthetic material doesnt stretch like natural leather. And buying soccer shoes bigger than your feet size is not a good idea. Update ! Although Nike Air Zoom Total 90 III are still expensive cleats, at least for some people, now actually it's a good time to consider them as your main target. Of course, if you have already decided that Nike cleats are what you want. After release of new Nike Supremacy cleats, the AZT 90's average price dropped to $120.